(a) Install a new deflector gasket and deflector onto the rear axle shaft. 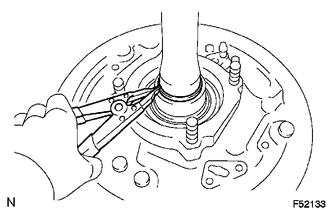 (b) Install the 6 bolts through the axle hub. 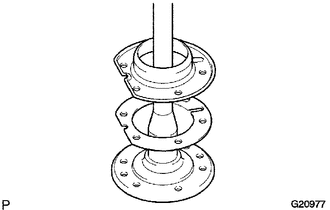 (c) Install the washer plate, as shown in the illustration, through the hub bolt, and install the hub bolt by tightening the hub nut. (a) Position the backing plate on the rear axle bearing, and install the 4 parking brake plates onto the rear axle housing bolts using 2 socket wrenches and a press. The left and right side bearing assemblies have different part numbers and are not interchangeable side to side. 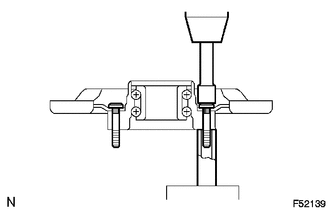 (a) Install the rear axle shaft plate washer onto the rear axle shaft. 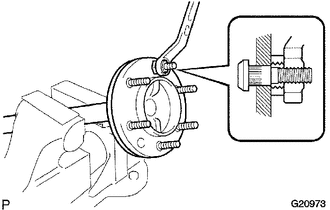 (a) Install a new rear axle bearing retainer inner onto the rear axle shaft. 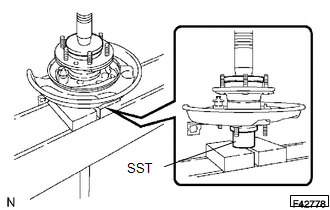 (a) Using SST and a press, install the rear axle shaft onto the rear axle bearing. (a) Using a snap ring expander, install a new snap ring.